Diamond is an ultimate symbol of true love. It is considered as best friend of every girl. Every girl in this world love the brilliance of diamonds, the bigger the better, as it has given air to love always. If you are a guy who are deeply engaged in love or you are getting married, you should relish the joy of love as you gift her sparkling diamond custom engagement ring design by Sevan. It is truly said that a ceremony of engagement has no meaning and it is incomplete if you don’t have an engagement ring since it is the thing bonding 2 persons into a lovable relationship. In order to make your engagement much more memorable, you can gift your soon-to-be-bride a special diamond engagement ring. The term diamond was derived from the Greek word “adamas”, which means “unconquerable”. With this defined, diamond truly has the invincible quality. Any person wearing it will get the magical quality. Diamond is the hardest substance in the earth, but if is referring to its capability of resisting from scratching. A sufficient force blow, in a very exact direction, will be able to crack, split, and crack a diamond. Yielding just one carat of diamond design by Sevan over 250 tons of rock, gravel, and sand need to be processed. The largest diamond found ever was the Cullinan diamond with 3,106 carats, as 1 carat is equal to 0.2g. Surprisingly, it was cut into 105 more diamonds. You will be able to determine the quality of a diamond with the four C’s named as Carat, Clarity, Cut, and Color. It has also different grades for the quality in verified laboratories like the AGS or HRD, or GIA. There is 80 percent of the diamonds of the world that are not fitted to be made for a jewelry. Diamond engagement rings design by Sevan is the most preferred and perfect for engagement. As a matter of fact, there are no ring that would be better in sealing your engagement than the brilliant shines of diamond rings, symbolizing your unconquerable between you and your future. The ultimate in the diamond rings is the only thing that all the women want for their ideal best wedding. There are several kinds of diamonds based on their clarity, color, carat, and cut. The best thing about it is that you will be able to select your own diamond engagement ring design by Sevan, getting it studded on gold or platinum rings. You can have your custom diamond engagement ring. You can select your own settings, matching the diamonds, in order to create a special piece of jewelry for both of your and the love of your life. You can have it in white gold, yellow gold or in platinum. Aside from the settings and the choices of the diamond, there are numbers of details that play a significant role in the ring’s design. Other than selecting a certain design, it is essential to keep in mind the variety of combinations that you have for the designs such as the thickness, the size, and the width of the engagement ring. No matter the design and style of your diamond engagement ring design by Sevan, making her happy is the most important. “Great” Diamond is an ultimate symbol of true love. It is considered as best friend of every girl. Every girl in this world love the brilliance of diamonds, the bigger the better, as it has given air to love always. 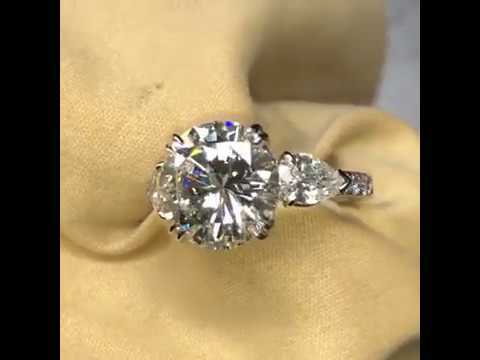 If you are a guy who are deeply engaged in love or you are getting married, you should relish the joy of love as you gift her sparkling diamond custom engagement ring design by Sevan. It is truly said that a ceremony of engagement has no meaning and it is incomplete if you don’t have an engagement ring since it is the thing bonding 2 persons into a lovable relationship. In order to make your engagement much more memorable, you can gift your soon-to-be-bride a special diamond engagement ring.